The Coos Bay Chapter, National Society Daughters of the American Revolution (NSDAR or DAR), was organized October 14, 1917, at the home of Edith Preston, by Fluella Dindinger, Organizing Regent, and Mary Woodworth Patterson, Oregon State Regent. "The name Coos Bay was chosen in honor of the Coos tribe of Indians, whose native habitat was the vicinity of Coos Bay and also because the membership of the chapter included women from several towns on the bay. The Coos Indians were of the Kusan family, formerly living at Coos Bay. The name is first mentioned by Lewis and Clark, who spell it Cook-koo-oose. The spelling has been various, Koo'as, Kowes, Coose and finally Coos. One Indian meaning for Coos ascribed is "lake," another, for "place of pines." Oregon Magazine, March 1926. The first settlement in Coos County was in 1853. Since then, timber and fishing, as well as the safe harbor have contributed to the successful growth of the county. Coal mining and even gold mining also helped the settlement flourished. Coos Bay is now the economic center of Oregon's south coast. It has wonderful recreational areas with several state and national parks, and annually attracts large numbers of tourists who come to experience its natural beauty. Coos Bay is located in Coos County in the southwestern corner of Oregon. The Port of Coos Bay handles most of the lumber and forest products shipped in the world. Coos Bay is Oregon's second largest commercial port. Long before the pioneers came and settled in this area, several Native American tribes made a living with the abundant food from the rivers, bays, and wildlife in the area. These tribes included the ancestors of the modern-day Coos, Lower Umpqua, Siuslaw and Coquille tribes. We welcome new members with new ideas and suggestions for ways we can continue to grow in the community. To become a member, you must be able to trace and prove your lineage back to the Revolutionary War finding a patriot ancestor who assisted in the cause of American independence. We have members who are willing and able to help you with your search so you may become a member of this outstanding organization. Our chapter meetings are held the second Saturday of the month, September through June. For assistance, please contact our chapter ​​Registrar​ or you can use our membership inquiries form. We would be honored to have you become a member of the Coos Bay Chapter, NSDAR. Thank you so much for visiting our website! Any woman is eligible for membership who is no less than eighteen years of age and can prove lineal, blood line descent from an ancestor who aided in achieving American independence. 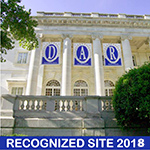 A complete list of eligibility information is available on the NSDAR “Become A Member” webpage. Meetings are on the fourth Wednesday of the month, 11:00 a.m., September through May. For assistance, please contact our chapter Registrar or you can use our membership information form. If you can trace your lineage to a patriot of the American Revolution, we would be honored to have you become a member of Coos Bay Chapter, NSDAR. Much more information may be found at either the National Society Daughters of the American Revolution (NSDAR) website or the Oregon State Society DAR (OSSDAR) website. ​For comments or questions about this website, please contact webmaster with questions.